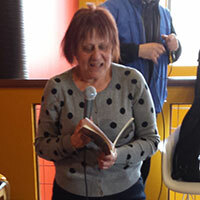 Rosa is a poet, novelist, and writer of short stories. She has published two books of poetry, Record of a Modern Heart and Flower of Poison by PublishAmerica (currently known as America Star Books). Her novel, The Maestro and Margherita has appeared as an e-book and was published by L.R. Hartley. Rosa also wrote short stories published in Moosemeat, chapbooks, and the former magazine Events Quarterly. She is currently a member of the ArtBar Poetry Series. And go in search for a book. What was never suppose to end. My eyes water, forgiven water. Until there is nothing more than this. Yes, until there is nothing more than this. A perfect ending to thoughts we all share.